I'll be the first to admit that I'm not the worlds most credible audio equipment reviewer. While I have a great appreciation for a good speaker, I don't typically discern between a good speaker, a great speaker, and an amazing speaker - if that makes sense. 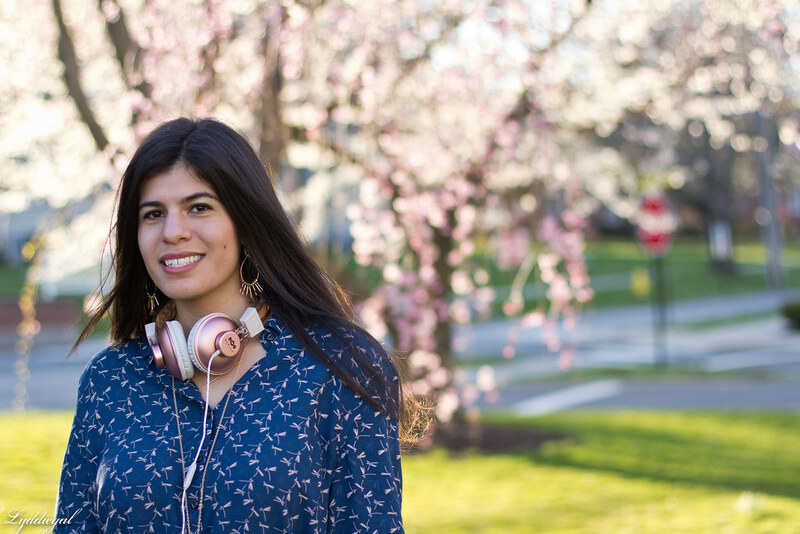 That being said, I wanted to evaluate the Positive Vibration headphones from House of Marley on more than just their looks - which of course was why I chose them. I decided the best way to do so was to compare them to two other sets of headphones I had at my disposal, my Audiofly earbuds, and Sean's Sennheiser HD598 over-ear headphones. I chose a few songs I knew I wouldn't mind listening to a few times each, and replayed individual segments of each with the three different headphones. On the queue was 'Heartbeats' by Jose Gonzalez, 'Bohemian Rhapsody' by Queen, 'Baba O'Riley' by The Who, and 'Africa' by Toto. Overall I thought the Positive Vibration headphones had a well rounded sound, though I would describe them as sounding a bit flatter than the other two, and with some songs not quite as crisp, but that was only something I noticed through the direct comparison. Full disclosure, I was listening to music streaming over Spotify on the 'extreme' quality level. For long time listening, the on-ear headphones are immensely more comfortable than the in-ear buds, but not quite as comfortable as the over-ear set, which you barely even notice are on. In terms of price point the Positive Vibrations are $60, which is about the same as the earbuds, and half the price of the Sennheisers. 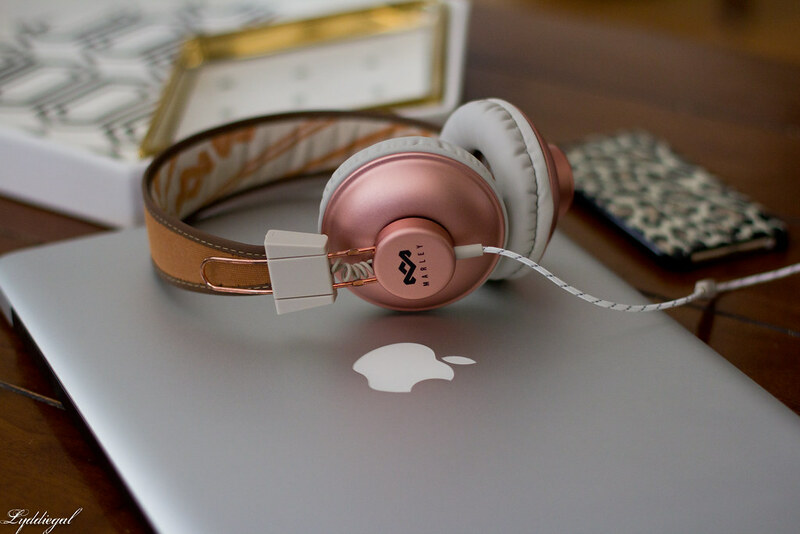 Overall I'm very pleased with the Positive Vibration headphones, I feel that for the price you aren't compromising much in terms of sound quality, and I adore the look - plus they come in two other colors if you don't care for rose gold. House of Marley provided me with these headphones for the purpose of this review. My views, opinions, and taste in music, and awesome dance moves are my own. I'm so glad that can style headphones are finally coming back into fashion, because earbuds are the bane of my existence. I love the colour of this pair from House of Marley but, admittedly, I have my eye on a white pair from a brand whose name I currently can't remember. 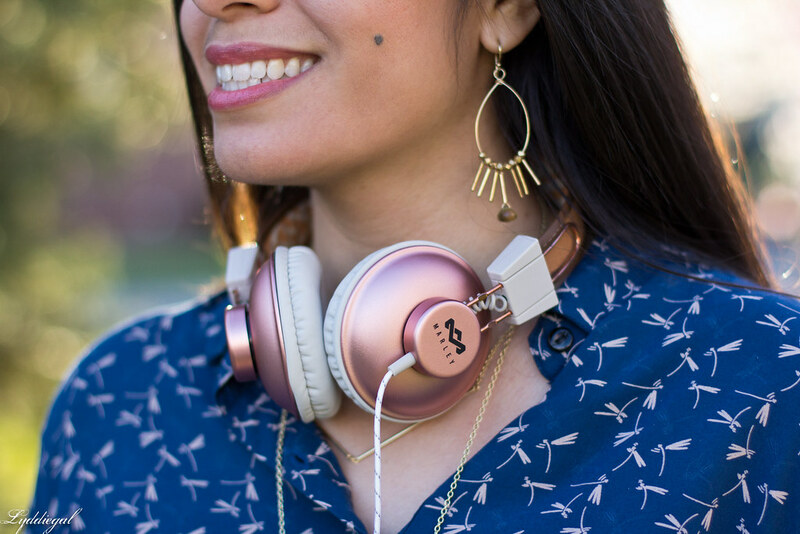 I know nothing about audio equipment and doubt I would notice a sound quality difference unless I did a direct comparison like you did and will freely admit that just like anything else, I will choose my headphones based on how cute an accessory they make ;) This rose gold pair does go just perfectly with this outfit! Love the color of these. Great dress too! I just moved offices and am now in a noisier part of the building, so I think I need these super cool headphones to drown out the noise (and look really cool). I am not a headphones or earbuds person... and the thought of being isolated from my surroundings in not that appealing. I tend to use earbuds more often due to their smaller size and headphones being impractical for working out, but my husband far prefers headphones for sound quality. I appreciate the thorough review! They certainly are more visually appealing than many headphones I see on the market! Ah man, how fun that you get to review some headphones! I recently got a pair of so headphones for Christmas with noise-cancelling white noise and I love them. The rose gold color they come in is so lovely! The print of your dress is adorable, and I LOVE the rose gold! 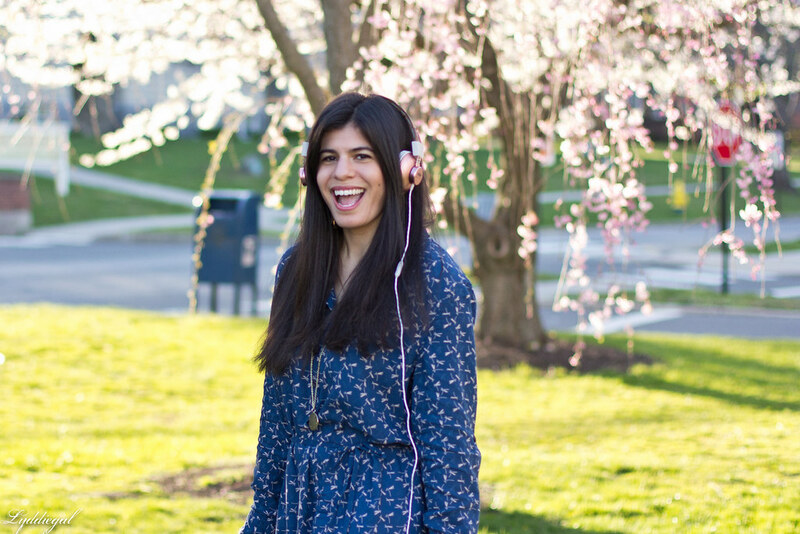 The headphones look very cute and your outfit is so pretty! I love the color and it's good to know the quality is good too! I love your dress! those headphones look so fun! That dress is gorgeous, I love the print and color! I always just use the earbuds that come with my phone, but last night my pair broke. Nooooo! I've never used headphones before but I may have to check those out! I normally use cheap earbuds but I prefer headphones. That is such a cute pair. What a cute outfit! 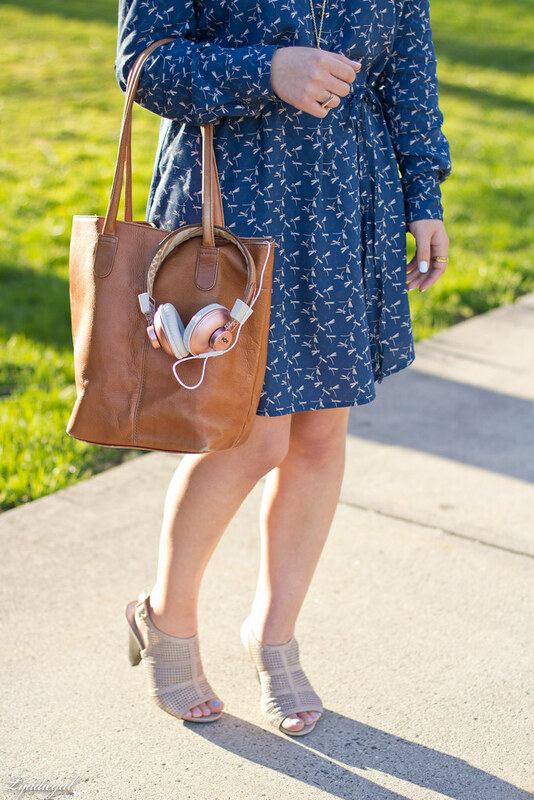 The pattern on that dress is lovely, and the earphones are so cute! Love a solid pair of headphones - will have to check these out! These even look nice with your outfit! I definitely would use them - these seem like a great deal! I love the color of the headphones. So fun and chic! Thanks for sharing these headphones! BTW Love your dress! 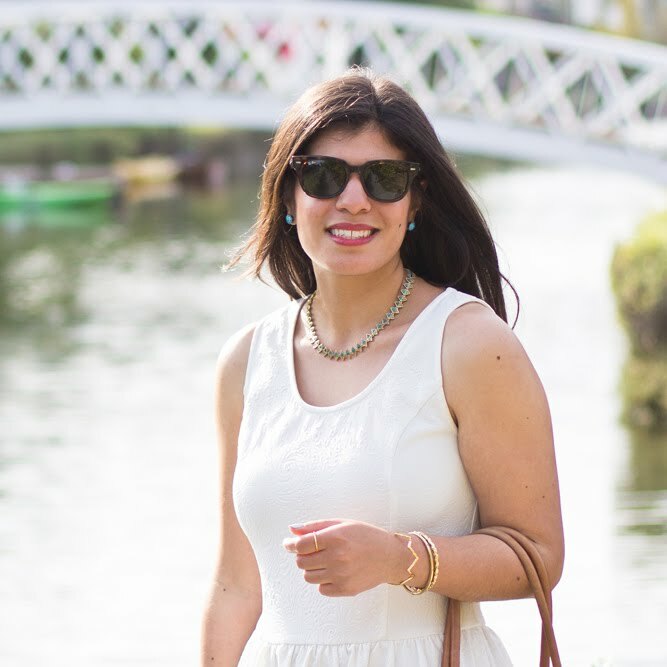 Love the boho vibes of the dress! Don't forget to check out my latest collab with EXPRESS and let me know what you think about the romper! Have a lovely weekend! I've been in the market a for a good pair of headphones and these sound great! Thanks for the review! Okay, how cute are you in that second to last photo? !